Earlier this week, I received a signed photo from actor Marton Csokas who’s in a Broadway play with Uma Thurman that ends in early March. Csokas is probably best known to genre fans for playing Celeborn in two of the Lord of the Rings movies and Trevor Goodchild in Aeon Flux. But you know what? I’m coming around to the idea that a Star Wars caper movie could be really fun. And in the little bit we see of Ehrenreich in these clips, he seems like he’s got Han Solo’s mannerisms down. So yeah, I’m looking forward to watching Solo on Memorial Day weekend… though I’m not sure how well it’s going to fare among all the summer blockbusters. (Avengers: Infinity War comes out May 4, Deadpool 2 is coming on May 18 and Ocean’s 8 will be out June 8.) But hey, that’s Disney’s problem. Am I alone in thinking that’s a lot of Star Wars? Now I’m totally going to be there to watch all of it as long as it is entertaining. But as far as collecting goes? I think it’s time to re-evaluate. I have literally hundreds of Star Wars action figures, and in a couple of months it will be time to buy new ones for Solo: A Star Wars Story. Except maybe I won’t. I’m not sure where I am with autograph collecting, either. So is it really worth pursuing autographs from the casts of these new films? Or am I better off trying to add more from the original and prequel trilogies? I haven’t really decided yet. Forget about the groundhog’s predictions… 2016 baseball cards have arrived, and that means baseball can’t be too far behind. I’m not too thrilled with Topps’ marketing choice this year (outside of Washington Nationals fans and Topps executives, does anyone actually like Bryce Harper?) but we’ll be pitching those wrappers, so I guess it’s all good. My first baseball card of the season? We’re less than three weeks away from the start of spring training. We’ll soon be able to read stories about which players turned up at camp “in the best shape of their life” and see clips of players hitting and fielding along with the basketball and hockey highlights on the nightly sportscasts. It also means that we’re close to the start of spring training autograph season. Maybe one year, I’ll actually get to go to Florida and experience spring training in person… honestly, short of a lucky lottery ticket on one of the rare occasions that I play, it’s probably not going to happen. So I’ll be writing letters and waiting to see what shows up in my mailbox. I’ve updated my Guide to Collecting Autographs Through the Mail page for 2016 for those who are new to this method of collecting, but basically you just send a baseball card you want signed along with a letter politely asking the player for an autograph and a self-addressed, stamped envelope for him to return it in. The day after Christmas, I received this signed baseball card from New York Yankees prospect Aaron Judge. I expected to see Judge play in Trenton this season, but wasn’t sure if I’d have a chance to ask for his autograph in person so I wrote to him during spring training. 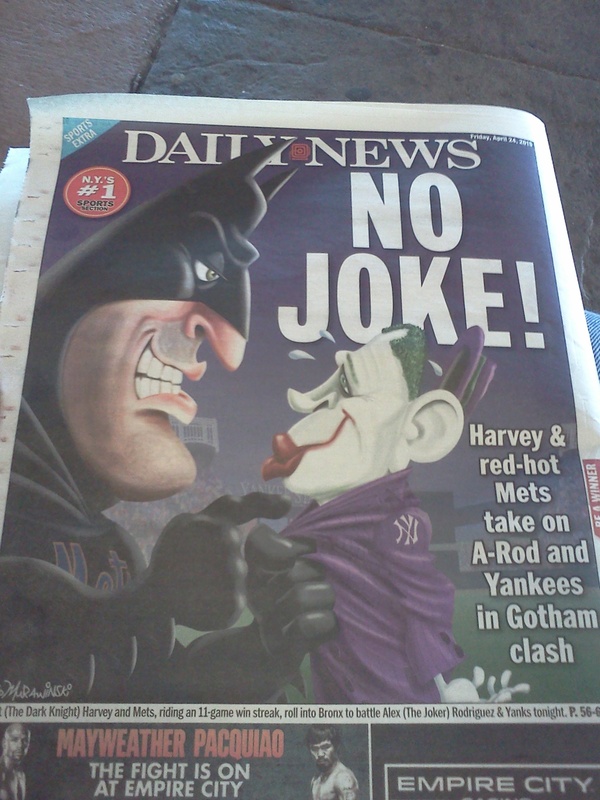 Remember this Daily News cover on the eve of the Subway Series? Those were good times. One fifth of the 2015 baseball season has already gone by, All-Star voting has been underway for weeks and we’ve seen historical milestones reached, even if some people would prefer to ignore them. The Mets had an 11-game winning streak, which included an undefeated 10-game home stand to open the season. They’re still in first place, but that success is a distant memory. Injuries have led to a lineup that’s featured Kirk Nieuwenhuis and his .088 as the starting center fielder and shortstop Wilmer Flores batting fifth… it’s turned out about as well as you’d expect. Factor in an overworked bullpen which has also been affected by injuries, and it doesn’t really matter how brilliant the starting pitching is…the Mets are having a hard time winning games. Due to a combination of reasons- a fluctuating work schedule, church responsibilities, and a severe allergy season chief among them – I’ve only been to one baseball game so far this year: the Mets’ home opener. (They won!) I haven’t been to a minor league or independent league game at all yet. Thanks to Stubby, I do have my 2015 Topps Heritage Mets team set… and I grabbed the Mets’ blister-carded Topps team set when I saw it in Trenton last month. But aside from those, I haven’t been adding to my baseball card collection. I’m thinking about whether I want to bother with Bowman, but I’m probably going to wait for Topps Series 2 at this point. My friend Greg added to my autographed baseball collection while he was in Florida. I’ve also gotten a couple more of the cards that I sent out during spring training back in the mail – my successful return rate is now up to 40 percent, 20 out of 50. 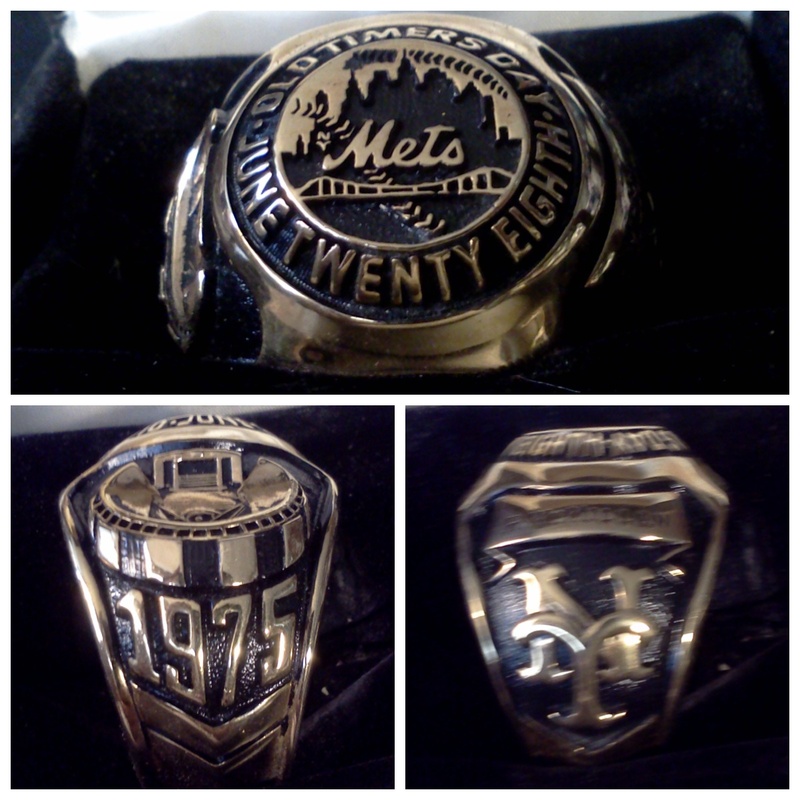 And thanks to a connection made through this blog, I am now the owner of a neat Mets Old Timer’s Day presentation ring that once belonged to Roy McMillan and is older than I am. When (if) I start going to more baseball games, I’ll probably be a more active blogger. If you want to keep in touch with me (and don’t mind the non-baseball content), I invite you to follow me on Instagram and Twitter. And I do answer most emails to paul@randombaseballstuff.com. Happy New Year! With 2014 officially behind us, we are that much closer to Opening Day. A few years ago, I resolved to stop making New Year’s resolutions. It’s the only one I’ve managed to keep. Writing – I want to write something here at RandomBaseballStuff.com at least once a week during 2015. I’m not going to try to be a baseball card blog, or a Mets blog, or a minor league baseball blog as I have at various times in the past (though I’m sure all of those topics will come up from time to time.) Instead, I’m going to pick one thing (related to baseball) that interests me each week and write about it… hopefully, whatever topics I choose will also interest some of you. At the very least, I’ll be true to my blog title. Baseball – In the past, I’ve set goals of visiting new ballparks or attending particular events. I’d like to do that this year, but they wouldn’t be very realistic. Instead, I’m going to aim to attend at least one Mets game at Citi Field and see the Binghamton Mets play at least one game in Trenton. If I’m able to go to more games, travel, or see other ballparks in the New Jersey or New York metropolitan area, that will be a bonus. Collecting – I plan to put together the 2015 Topps and 2015 Topps Heritage Mets team sets, and pick up the 2015 team sets of the Las Vegas 51s, Binghamton Mets, St. Lucie Mets, Savannah Sand Gnats, Brooklyn Cyclones, Kingsport Mets (if they make one) and Trenton Thunder. I hope to add a few autographed baseball cards to my Mets autograph collection. If I can do more, that will also be a bonus – but these are my priorities. Have you set any goals for 2015? You can follow Paul’s Random Baseball Stuff on Facebook or Google+, see my photos on Flickr and Instagram, and follow @Paul_Hadsall on Twitter, where I talk about about a variety of things in addition to baseball. “I’m the lucky guy that happened to be in the right place and catch the ball … so If anybody deserves to have that ball in the trophy case is the man who hit it and put us in the World Series for the third time in five years,” Burke told the Associated Press. I have no idea whether Burke made a smart move or not because I couldn’t guess how much the baseball might have been worth if he had put it up for sale. If we’re talking about a $10,000-$15,000 item, I think Burke made a good choice to focus on making more priceless memories instead of figuring out how to spend the few grand he’d get after auction fees and taxes. But if the baseball would be valued in the high five figure or low six figure range, Burke would have been smarter to sell. For better or worse, I don’t think I’ll ever have to worry about making that kind of decision about a home run ball.